« ARCHER & ARMSTRONG #5 Delivers The Wrath of the ETERNAL WARRIOR! Bona fide heavy metal front woman and activist OTEP Shamaya has rallied up the tribe and is ready to deliver the first LIVE album of her career, entitled Sounds Like Armageddon, out November 6th. If you haven’t had a chance to see her in action now is your time to hear her roar. Sounds Like Armageddon hits hard with eleven gut wrenching tracks from four albums. OTEP tears through classics like “Battle Ready”, “Blood Pigs”, “Rise Rebel Resist” and “Fists Fall” and will have you banging your head in no time! 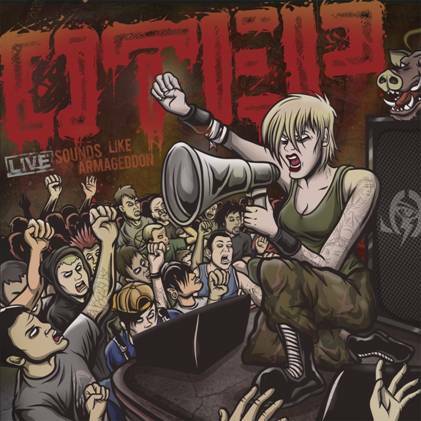 The album also includes the fan favorite cover of Nirvana’s “Breed” that has become a staple at the end of OTEP’s live set. With her ravaging vocals and powerful messages OTEP is a multi-dimensional; poet, illustrator, author and activist. Since 2000, she has continued hold her ground, fight for her beliefs and empower thousands of people worldwide. She is currently in the studio working on her sixth full-length studio album, out in January 2013. Watch the music video for “Fists Fall” and experience the force known as OTEP. Check on tons of new OTEP merch designs and pre-order Sounds Like Armageddon through the Victory Records’ webstore. Download the new Victory Records Merchandise catalog here.